Capacity 250 mt / 24h. A new installation, full electronically controlled. Ready bread mixes - Multi grains, Corn bread mix, Ciabatta-Italian bread, French Baguette, Dark rye bread, Oat bran bread, Lupin base mix, French croissant, Original Danish Pastry, Sunflower seed bread, Dark fiber mix, etc. Capacity 200 mt / 24h. A new installation, full electronically controlled. 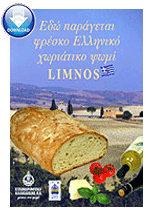 Durum Semolina (Fine and coarse) for pasta, creams, kuskus, special breads, topping etc. Capacity 120 mt / 24h new installations, full electronically controlled. Maize grits for snacks production ( no. 101 & 105 & 108 & type C) - with specifications as requested. Maize yellow flour for admixture specially made for breads and baby foods. s.
Storage and silos with a total capacity of 65,000 mt. Loading and discharging capacity of about 300 mt/h. Drying plant suitable for wheat, maize, rice, sunflower seed with a capacity of about 1.100 mt/24h.